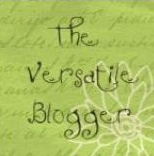 My thanks to KingstonMama for including me in her Versatile Blogger award list! I'm honored that she finds my blog inspiring. Google and Blogger aren't playing nice tonight, so I wasn't able to comment on her blog post or send an email to thank her properly. Here's hoping she sees this blog post. Thank you, sweetie! 1) Besides card making, I love to crochet! I crocheted many years ago and haven't touched it for years, so am re-teaching myself. 2) I worked for ten years in pharmaceutical sales traveling all over Kentucky, So. Indiana and Cincinnati. I "retired" early when my dad became ill.
3) I have seven wonderful, beautiful, grandchildren and another on the way in July. 4) I have enough stamps and card making supplies to open my own store . . . seriously. 5) My husband is the most wonderful man in the world. I'm so lucky and a better person for loving him. There are so many wonderful bloggers out there that making a short list to pass this award to would be impossible for me. So if you're reading my blog today, consider yourself a winner! I appreciate the visits today. Congrats to you, my dear friend! Woo-Hoo! Congratulations to you. I love your blog and am so glad the I call you a friend.